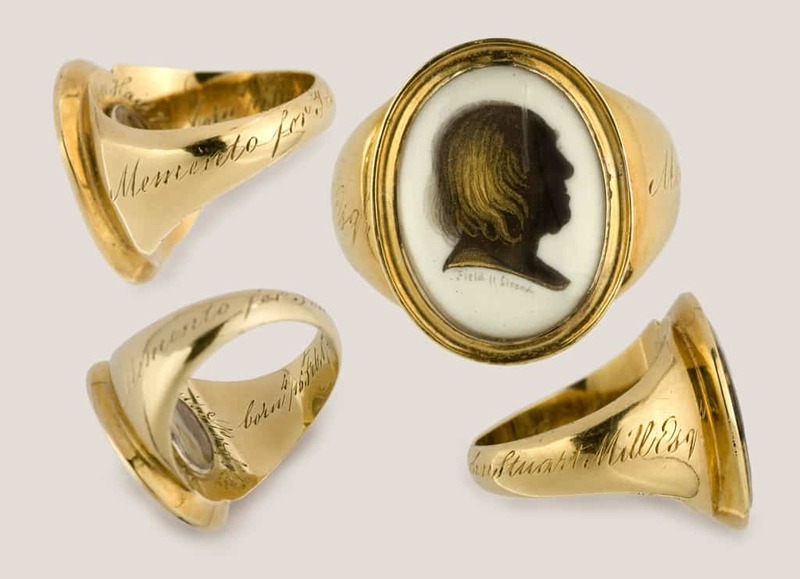 Mourning ring Honoring Jeremy Bentham, Bequeathed to John Stuart Mill, 1832. Gold with a Gold and Brown Silhouette of Jeremy Bentham on Ivory. Mourning rings are memorial rings used to commemorate a deceased relative, close friend or an historical figure. Early accounts of their use date from the Roman Empire, around the time of the defeat at the battle of Cannae against Hannibal (216 BC). The Carthaginian general ordered the golden rings to be taken from all slain Romans which were then sent to Carthage as evidence of the many Roman noblemen who perished during the battle (only the elite in Roman society were granted the right to wear golden rings during the reign of the Caesars). In remembrance Romans would take off their golden rings and substitute them with ones of iron in days of general mourning.2 In more recent history, mourning rings were identified from the 15th to the early 20th century with the apogee of their wearing occurring during the 18th century. 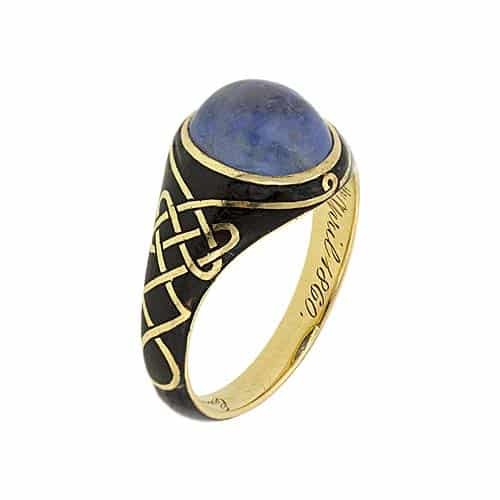 During the later years of the medieval period it became customary in some circles of society to remember a departed loved one with a plain – half – hoop ring, engraved or enameled with the initials of the deceased along side the date of departure. In the 17th century hoops with a triangular cross-section were added to this repertoire, as well as rings with a lozenge or hexagonal bezel on which the initials of the deceased were enameled or engraved, accompanied by mottos as “memento mori” or vanitas symbols. As with most jewelry, we can recognize some trends in mourning rings11, following the overall style of the days. Throughout the ages a simple hoop ring remained in fashion. The materials used extended from gold and silver to pinchbeck, copper and bath metal. Hoops, half rounded hoops or hoops with a triangular cross-section with a lozenge or hexagonal bezel. Enameled or engraved with mottos and/or vanitas symbols. Enameled simple -half rounded – hoops with cut out skulls between foliage designs. Plain hoops with the name and date of death on a ground of black or white enamel. Also plain hoops with bezels, set with gemstones. In the earlier part of the period; coffin-shaped bezels enclosing a skeleton under a clear crystal cover. In the latter part; oval bezels with a golden monogram of the deceased on a ground of hair, urns and other vanitas symbols crafted from hair. From about 1735, elegant wavy hoops or scrolls, enameled and with the names of the deceased. Also, bezels set with gemstones or skeletons under a clear crystal cover. Marquise-shaped bezels came into fashion. Plain hoops were still the norm but also gypsy ring types with portraits on ivory, hair backgrounds or gemset (diamonds). Many times the text reads “ob” or “obt“, which is an abbreviation for the latin word “obiit”, meaning “died”. The enamels were usually monotoned black or white; black was used for married persons, while white indicated an unmarried – usually young – person. In the UK almost all jewelry was exempt from compulsory hallmarking in the period from the early 18th century until 1973, with the exception of mourning (and wedding) rings. It was not until 1878 that the levying of duty on mourning rings was ceased.13 The reasons for the exception are not clear, but they may have to do with the fact that these rings were usually of a high carat (22 ct) and made from gold coinage (under control of the mint) and thus needed to be hallmarked for consumer protection. Victorian Sapphire and Black Enamel Mourning Ring of Emma Mathilda Halford (Died 9th April 1860). Girod, Daniel. Antieke Memorie-Sieraden. Kunst & Antiek journaal, May 1998. Kunz George Frederick, Rings for the Finger. J.B. Lippincott Company, Philadelphia and London. 1917.